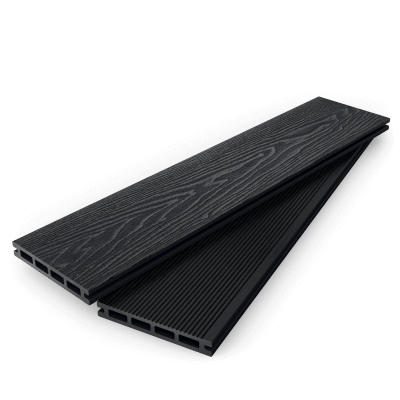 Why Dino Decking™ Composite Boards? Dino Decking composite decking boards are designed to be durable, low-maintenance, cost efficient and environmentally friendly. Made from 55% recycled wood, 40% recycled HDPE and 5% additives (colouring, bonding agent etc), Dino Decking footprint is smaller than that found with timber decking. Covered by a 10-year warranty, our composite decking boasts a 20-30 year life expectancy. Dino Decking™ boards offer; anti-splinter, anti-slip and anti-mold. An all around, better performing board when compared to timber. Our composite decking boards are available in eight colours, Silver, Savanna, Amber, Cedar, Mocha, Ash, Slate, and Graphite. Available in lengths of 2.4 and 4 Metres. Check out our size and price calculator for your instant quote. Collection or delivery is available from our United Kingdom warehouse located in Greater Manchester. Our sample pack contains a sample piece of each colour currently available. 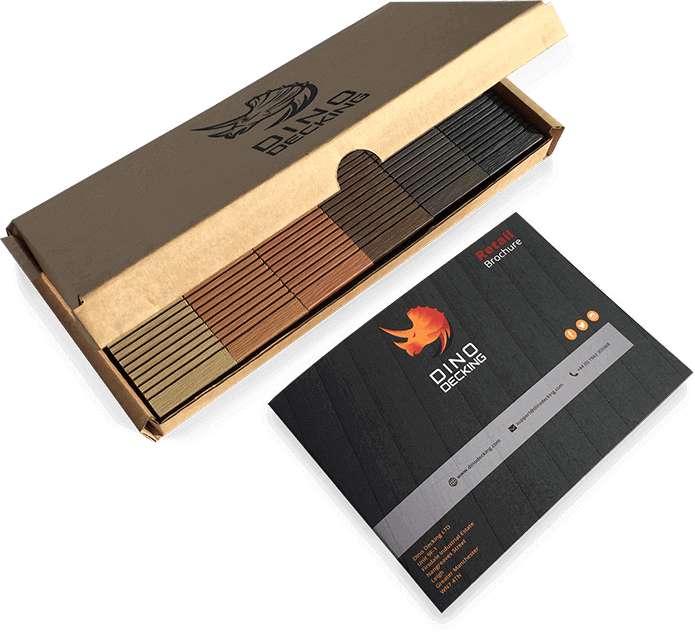 Order your free sample pack today to compare the colours and get a true feeling of the Dino Decking range! At Dino decking we take pride in offering competitively priced composite decking boards and other composite products to the UK market. We are confident that we can beat any like for like quote you present us with. Not only will we offer you Dino composite boards at the best possible rate, but you will be buying a product that is built to last. We assure that you will not find a service or product with better value than Dino decking. Contact the Dino group today to discuss any quote you may have received, we’re certain we can beat it, like for like.